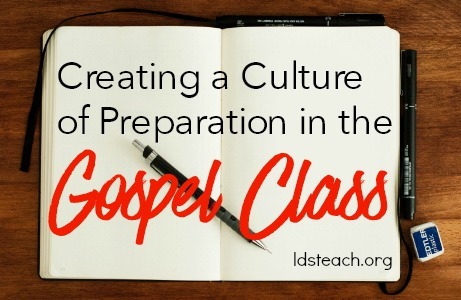 Why is creating a culture of preparation in a gospel class important? A prepared class equals or even surpasses a prepared teacher in importance in the gospel classroom. With the Come, Follow Me program in Priesthood and Relief Society, unprepared participants make for very same-y, low-level, boring discussions. It also puts a tremendous amount of pressure on the teacher facilitator, who came expecting discussion and instead got crickets. 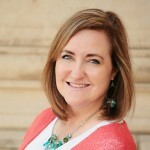 The focus of Come, Follow Me is personal growth, and that can’t happen solely in the meeting. The reading must be done. But how do we create a culture of preparation in gospel classes? Time! No time! Not enough time! Too much else to do! Simply forgetting…good intentions, but life got in the way and it just slipped their minds. Reading didn’t really interest them or was over their heads/hard to understand. No/weak connection between the reading and what actually goes on in class. The reading was too hard/over their heads. I don’t think the reasons that people don’t prepare for gospel classes is much different from regular school. So let’s look at these reasons and delve into how to respond to build a culture of preparation in our classes. How do we address the challenges? Sometimes we think things take longer than they really do to complete. The average adult reads about 300 words per minute. In fewer than two minutes, I copy and pasted the text of Elder Christofferson’s talk from the October 2017 General Conference, into a Word document and did a word count. It was 2,232 words. At an average rate, that would take a reader under eight minutes to read the talk. Consider sharing the estimated time to read. When we hear “fewer than eight minutes,” it seems almost silly to say we don’t have time. 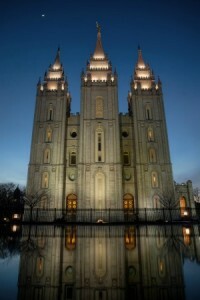 Encourage people to listen to the talks, available on both lds.org and in the app. Reading is preferable, as it allows the taking of notes (and we simply learn differently when we read), but listening is far better than no preparation. Send reminders. We’ve got an entire article on different reminder methods you can use (It’s really good, promise). In our information-saturated age, no one method will work for everyone, so consider a multi-pronged approach, not relying on any one method in isolation. Provide multiple ways to access the information. In addition to the links, you may wish to provide paper copies of the next week’s talk in the previous week’s meeting for those who prefer paper or who don’t have internet access. We like what we know. Familiarity does not breed contempt in learning. The opposite is true. Consider highlighting something interesting about the author or topic or reading section when the reading is offered. Match struggling members with a mentor reader who may be willing to discuss the reading with him/her. This may be a home or visiting teacher or a quorum advisor. Everything is more interesting with a friend! This can be done over the phone, so no pressure for a meeting. They didn’t really see why they should do the reading. This is a new program, so we need to make sure that members really understand how important the reading is. It may be a good topic for a First Sunday lesson in Priesthood/Relief Society or as a section of a Sunday School class. Consider asking people to prepare with intention for a few weeks and then bear testimony of the experience and how it impacted them. Try to create in people’s minds the idea that there is a benefit in preparation for them in their lives. You have probably spent hours reading about the Come, Follow Me program, but most people have not. We have to onboard them to the new way of being so they know the expectation and understand the part their preparation plays. They don’t understand why they’re being asked to read this particular thing. Explain how the material is chosen and how it fits with previously learned readings. Share the questions ahead of time (see our Question Stems handout for ideas on creating questions) so that people can see the learning and discussion that will arise out of the discussion. Believe important course content will be covered in class anyway. Some people may feel that they have nothing to offer. They may believe that others will make all of the important and insightful comments will be made by others, so they don’t feel the obligation to read. We can make sure that people feel valued by building on their comments, gently leading their comments back on topic if they are tangential. Leaders may need to ask over-contributors (see our article on that) to hold back. We need to save low-level, simple (yet true and accurate and useful) for those who are at that level of gospel knowledge and experience. This is how we grow. Oops. We have to make sure that it is important to read. If people don’t prepare, but the teacher then shoulders all of the burden for them, we send the message, “Don’t worry about reading. If you don’t, we’ll do it for you, so just relax, you’re not really that important here.” Ouch. Teachers must make sure that they don’t go off on their own gospel hobby horse with the lesson. It can be tempting for teachers to over personalize the topic, making it just about them. It is critical that the lesson be made broadly applicable, anchored in the author’s intent. Have other ideas or suggestion? Please feel free to share your ideas! The photo in the cover image is by Mike Tinnion on Unsplash. May I use some of your material in a teaching course for our ward? Of course! Anyone is welcome to use anything!